High-end fashion store: Komakino 2.0 _ Mathias Vestergaard Corp.
Komakino Guerrilla Store Version 2.0 is a high-end fashion store, built around a nomad-concept: the store moves to a new location every year! Currently it’s located in Vancouver, Canada. 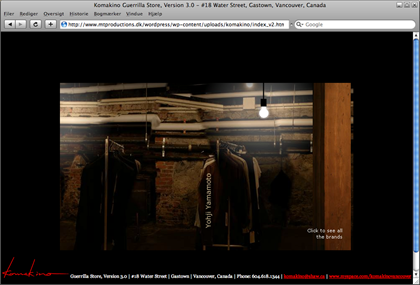 The website shows real photos from the store in a panoramic view, giving the user the option to turn around in the open space, and a possibility to discover all the brands: Number (N)ine, Raf Simons, Rick Owens, Ann Demeulemeester, Costume National, Yohji Yamamoto, Viridi-anne and Mihara Yasuhiro. The store is currently running version 6.0, but you can still visit the archived version 2.0 here. You can also read about version 4.0 here.